The Chamber continues gathering support for changes to the Employer Health Tax, which was a surprise announcement in BC Budget 2018. If implemented as proposed, the EHT will have serious consequences for British Columbia's economy. The Chamber urges you to learn more about this new tax, which will be directly applied to businesses with a payroll of more than $500,000, as well as through increased property taxes as municipalities pass on the cost of the tax on their payrolls. The government is promoting the tax as a way to replace revenue lost from eliminating MSP premiums. However, the EHT will end up costing much more and will make operating a business more difficult. For consumers, this will lead to higher prices for goods and services and fewer options. It will also affect workers by making employers hesitant to hire new staff or raise wages for existing staff. Having a tax directly linked to business growth is the wrong approach and sends the wrong message to people looking to invest in BC. The Chamber will not let this issue go away quietly. In October 2018, Chamber CEO Catherine Holt appeared before the provincial government's Standing Committee on Finance and Government Service. The Chamber voiced its concerns to the committee, which includes members of government as well as the opposition. 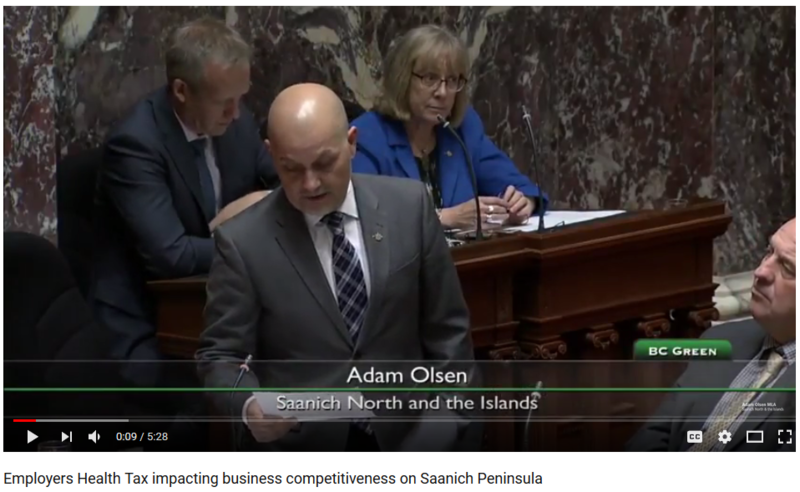 Making sure business is heard before this new tax is implemented should be a priority for politicians and community leaders — watch Saanich North & the Islands MLA Adam Olsen question the government on the EHT here. You can help make sure the province understands your concerns by signing this letter to BC Finance Minister Carole James. Please sign and send to communications@victoriachamber.ca, so we can ensure they get the minister's attention.